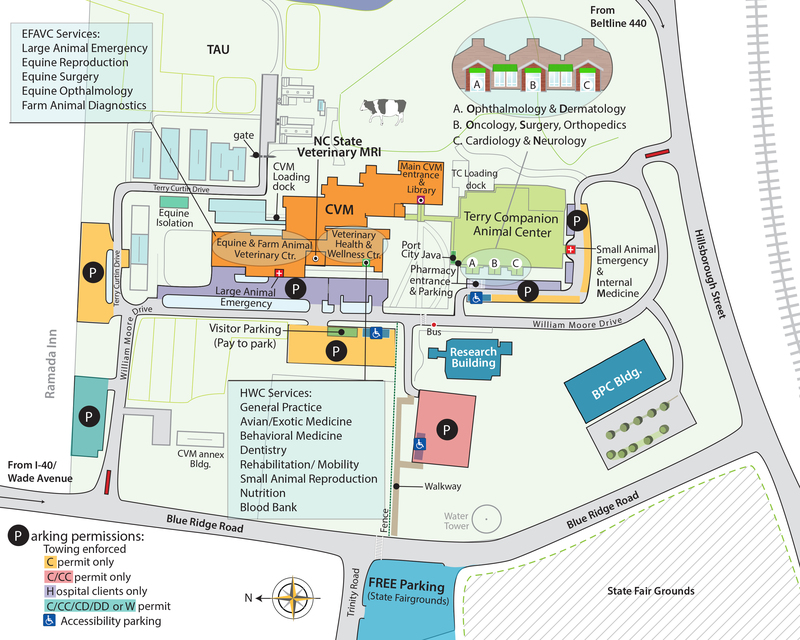 It’s hard not to resort to purple prose writing about CarLotta Mitchell, an accounting technician at the NC State College of Veterinary Medicine (CVM). That’s partly because she has an irrepressible personality, and partly because she always — and we mean always — wears something purple. “I’ve always just worn purple,” she says. “My mother said that even when I was little, if she didn’t dress me in purple clothes, I would cry.” So today, that is her signature look. Another childhood wish was to work at the CVM. “I went to the school’s Open House as a kid,” she remembers, “and after that I always wanted to be a veterinarian.” That turned out not to be an affordable goal for the Mitchells, but even so, the dream of working for the college stayed alive, even after she was grown and found herself working for a construction firm. 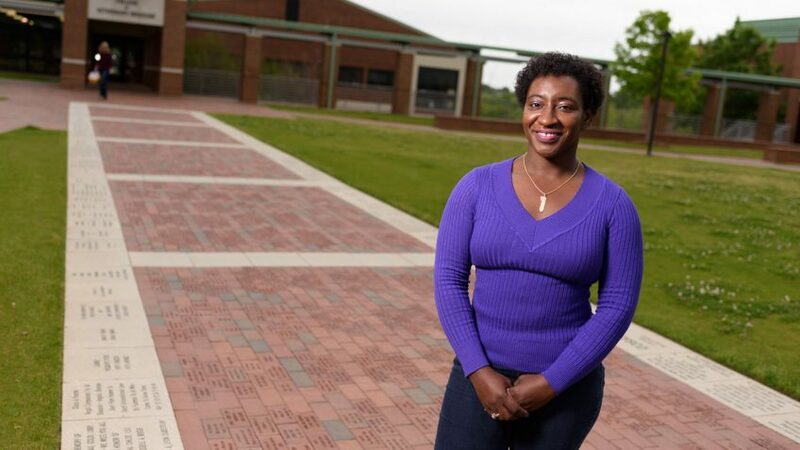 She persisted in her efforts to make the move to NC State, and after a year in a contract position in the controller’s office, she landed a permanent job right where she wanted to be all along. “Sometimes I look out the window at the cattle grazing outside and I forget that I’m at work,” she says. CarLotta has another reason to love the CVM. She grew up with dogs in her life and when she finally went out on her own, of course she had to have a dog all her own. 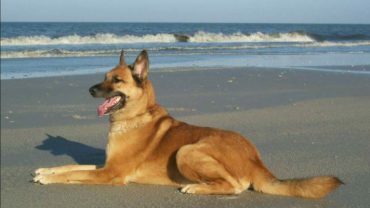 That turned out to a 120-pound German shepherd she named Sergeant Mitchell. The reason for that name was her sister, Shaconda, who was in the military, had just achieved the rank of sergeant when CarLotta got her new canine companion. So the name was in honor of her sister’s promotion. Sergeant Mitchell and CarLotta Mitchell marched side-by-side for 15 years, and to say their relationship was a close one doesn’t even begin to describe it. It was a true partnership. “It was like having a person in the house,” she says. “He was so smart and so sweet.” There was such a rapport between them that “Sarge” would anticipate what was coming next, and would automatically cooperate with CarLotta in accomplishing the task at hand. CarLotta says that Sarge and her other pet, Casian, were “brothers,” even though Casian was a white cat. When Casian passed away some seven years ago, right before the end he and Sarge seemed to have a moment of farewell, with Casian licking Sarge’s nose. Finally, last year on July 4, the beautiful friendship drew to a close. Sarge’s health had declined to the point where his body would no longer do his bidding, despite the best efforts to help him. In pain from hip dysplasia, his weight was down from 120 pounds to 70 pounds. Unable to control his bodily functions, he was rapidly declining. CarLotta realized that it was time to make what she calls “the toughest decision of my life.” With the compassionate support of colleagues and friends, CarLotta was at Sarge’s side when he was humanely put to sleep at NC State. In an effort to cope with the loss, CarLotta took advantage of the grief counseling available at NC State. 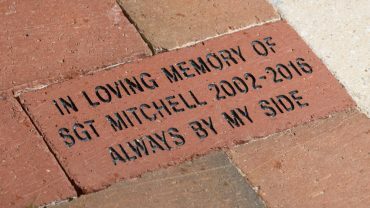 She wrote a poem about her time with Sergeant Mitchell, and even created a Facebook page memorial to him. “I was able to pick out the location where his brick would go. It’s on the path I take into work and I see him every day. I don’t know what I would have done if I wasn’t here,” she says. When members of the CVM community also support the college financially, it not only helps meet the ongoing needs of the organization, it is a powerful demonstration of personal commitment and dedication that sends a compelling message to the rest of the world and encourages others to consider their own commitment to the goal of improving animal and human health. How to Give: For more information about giving to the College of Veterinary Medicine, please visit our giving opportunities page.